Web-based tooling for BPMN, DMN and CMMN. Use bpmn-js to display BPMN 2.0 diagrams on your website. 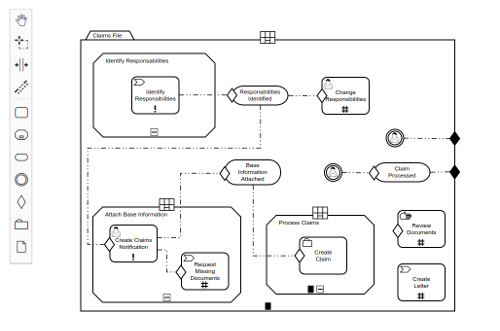 Embed it as a BPMN 2.0 web modeler into your applications and customize it to suit your needs. Use dmn-js to display DMN decision requirement diagrams, decision tables and literal expressions in the browser. Embed it as a DMN 1.1 editor into your web application. Use cmmn-js to display CMMN 1.1 diagrams on your website. Embed it as a CMMN 1.1 web modeler into your applications and customize it to suit your needs. Want to collaborate on your BPMN diagrams? Try out Cawemo, a free online tool for designing, discussing and sharing BPMN diagrams with your team. You can easily upload existing BPMN diagrams or create new ones in Cawemo - Try now for free.